Add your request here and our team will try to post this content on the site! 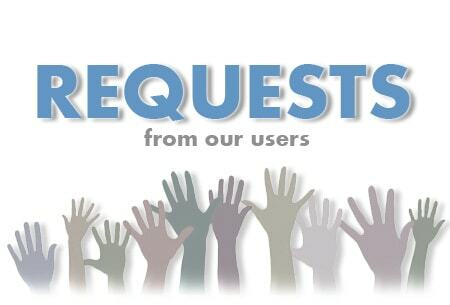 Only registred users can add the requests. "Pelham & Junior - Windy City Aura Sample Pack"
Please Sir & Thank you for ALL that you do for us ALL!! "Decap - Drums That Knock Vol. 7"
Plugin - Serato Sample (AU). Is it possible to get Algonaut Atlas 1.2 ?? Big Fish Audio discontinued the Wall Of Vinyl series and I can't find Vol 1 & 3 anywhere. If anybody has Big Fish Audio Wall Of Vinyl 1 & 3, that would be very appreciated. Really love to have it uploaded here also. only part 3 of the download links is available could you please make the 1st and second part available. Hello I need this Softwares for Mac (Dorico, Superior Drummer3, HOFA plug-ins) if is possible. 8Dio Century Strings please upload Thanks! I'm seeking DERAILER from PHYSICAL AUDIO.